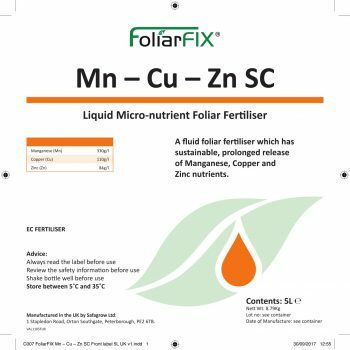 A fluid foliar fertiliser which has sustainable, prolonged release of Manganese, Copper and Zinc nutrients. Cu 110, Mn 330, Zn 84. Carrots 1 L/Ha When crop is 15cm tall. For moderate to severe deficiencies repeat at the same rate in intervals of 10-14 days. Water rate: 200 L/Ha. Cereals 1 L/Ha At 2 leaf stage to first node detectable (Zadok’s GS 12 to 31). Water rate: 200 L/Ha. In case of severe deficiency increase to 2 L/Ha or make 2 applications at 1 L/Ha. For autumn sown crops an application prior to winter dormancy is strongly recommended at the above rate. Water rate: 200 L/Ha. Grass (amenity) 1 L/Ha As soon as growth starts in the spring. Repeat sprays at intervals of 10-14 days as required. Water rate: 200 L/Ha. Leeks (field grown) 1 L/Ha 14 days after transplanting or where direct sown, when the crop is 15cm tall. Application can be repeated in 10-14 day intervals. Water rate: 200 l/ha. Maize 1 L/Ha 14 days after transplanting or where direct sown, when the crop is 15cm tall. Application can be repeated in 10-14 day intervals. Water rate: 200 L/Ha. Onions (field grown) 1 L/Ha 14 days after transplanting or where direct sown, when the crop is 15cm tall. Application can be repeated in 10-14 day intervals. Water rate: 200 L/Ha. Peas & Beans 1 L/Ha At 4-6 leaf stage. Water rate: 200 L/Ha. Potatoes 1 L/Ha One week after 100% emergence. For moderate or severe deficiency the application may be repeated in intervals of 10-14 days. Water rate: 200 L/Ha. Sugar beet 1 L/Ha From 4-6 leaf stage. For moderate or severe deficiency the application may be repeated in intervals of 10-14 days. Water rate: 200 L/Ha. Mn – Cu – Zn SC should only be stored in its original container. The product should be stored away from direct sunlight and in frost free conditions, between 5˚C and 35˚C. Slight thickening can be a product characteristic under certain conditions. Containers should be shaken before use and rinsed thoroughly. Thickened product entering the spray tank will naturally disperse when mixed and diluted. Read the label before use. Always shake the bottle well before use. NEVER MIX PESTICIDES IN THEIR CONCENTRATED FORM. If Spray volumes are less than 200l/ha or if you are in doubt, then perform a “Jar test” on the mix before starting. Half fill the tank with water and switch on agitation. Always make sure the additions are fully mixed until dissolved or dispersed before adding the next product. • Add water conditioners, if needed. Add granules powders and mix well. Pre disperse if possible (WP, DG). • Add Mn – Cu – Zn SC and other flowables (SC, SE). • Add Emulsion Concentrates and crop oils (EC). • Add water soluble: liquids and solids. (SL, SP). • Add wetters, if needed and top up with water. Provided these guidelines are followed almost all tank mixes are physically compatible, with continuous agitation. If agitation fails, for any reason, then it is essential to clean out the tank immediately. Mn – Cu – Zn SC is tank mixable with most spray applied chemicals. Read all labels carefully and adhere to the instructions for use and advice regarding whether or not the products should be co-applied. If mixing products in the spray tank, add product first. Many variables outside the control of Safagrow can influence the performance of co-applied products and therefore co-application is entirely at the risk of the end user. Mn – Cu – Zn SC is a non flammable product and does not pose any significant health risk if used in accordance with the label and usage information. The correct Personal Protective Equipment must be worn whilst using, please refer to SDS section 7. Keep out of the reach of children. Do not store near food. Do not reuse container.